The word desert does not usually conjure up the word enchantment, but there is one section of desert that can be considered akin to enjoying a beach all to yourself on a bright, sunny day. The temperature feels perfect—in the upper sixties with zero humidity and not a cloud in the sky. You lie on one of the numerous sand dunes while feeling the gentle breeze. This momentary getaway is so refreshing, so relaxing, you do not want to leave. 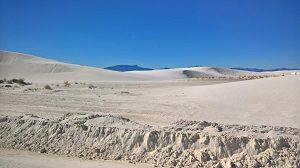 If you ever want to get away from a busy schedule, traffic, and crowds, find the time to relax in a pleasant environment, White Sands National Monument is ideal. In 1933 Herbert Hoover declared White Sands Desert a national monument under the Antiquities Act. Over 140-thousand acres were set aside for scenic, scientific, and educational interest. 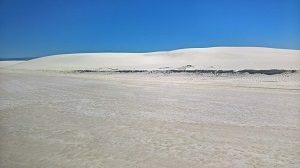 The white sands are different from beach sand because there is no water. Without the sounds of crashing waves, you’ll find numerous hills of white sand, which is gypsum. The hills provide a great opportunity for exploring. Wave-like dunes of gypsum sand engulf 275-square miles of desert, creating the world’s largest gypsum dunefield. You’ll relish the peace and quiet. It is hard not to love the picturesque view of the mountains in the distance surrounding the monument. The white sand reminds you of snow that the plows cleared on the road leading up to the site. On the dunes themselves, you feel you are playing in the snow. White Sands invites kids to play and go sledding. You might be inclined to take plenty of photos or write notes on the sand. At night, stargazers love this site, and many people visit when the full moon shines. The white color of the moon matches the sand. One area resident and visitor to the park told me that you’ll see beautiful sunsets at this location where couples find it pleasantly romantic. Even with others in the park, the site is so vast, you feel like you are the only people on the planet. Fees: $20 per vehicle, $10 per person (for adults 16 and older), and $15 per motorcycle. You can obtain an annual pass for $40. Entrance fees are good for seven consecutive days. Every year, the National Park Service picks certain holidays when free admission is offered to everyone. 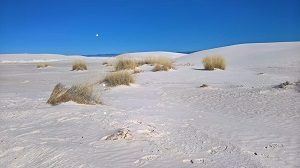 White Sands National Monument is in the Tularosa Basin on US Route 70, 15-miles southwest of Alamogordo and 54-miles northeast of Las Cruces New Mexico. Facilities, services, and programs are accessible to all. 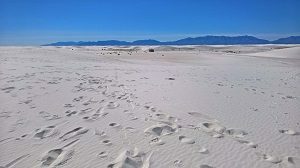 White Sands is a pet-friendly park. For more information visit www.nps.gov/whsa/.